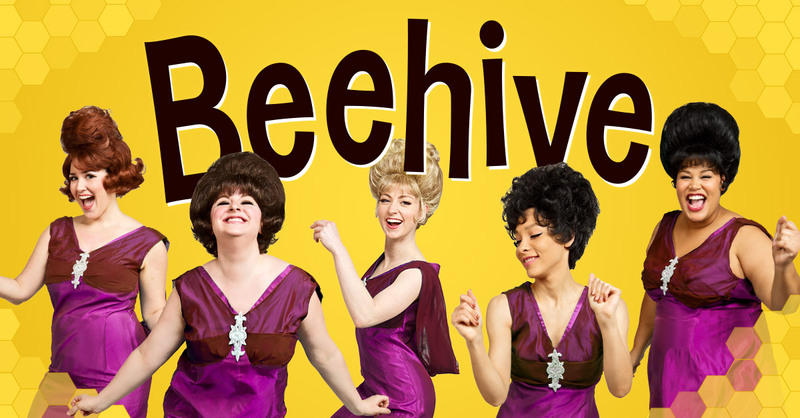 A fun, frothy flashback to the fabulous females of 1960s pop music, Beehive features non-stop hits from early decade bubble gum classics to the explosive late ‘60s soul sound. 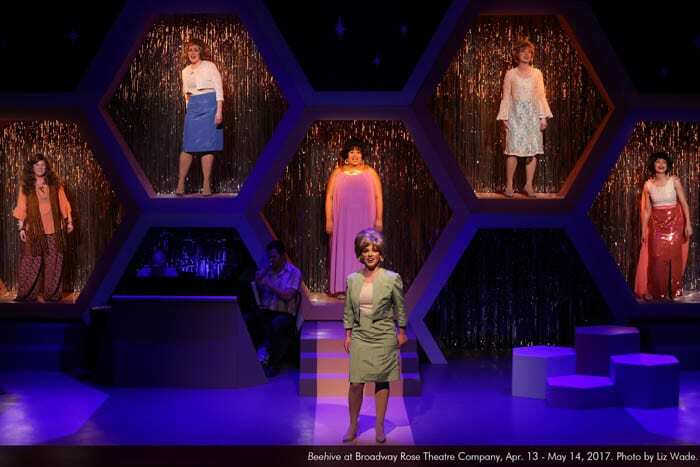 Paying tribute to performers such as Lesley Gore, The Shirelles, Brenda Lee, Tina Turner, The Supremes, Aretha Franklin, and Janis Joplin, this irresistible revue will fly you back in time to experience firsthand the music that thrilled a generation. Performance runtime is approximately 2 hours with a 15 minute intermission. Alyssa Birrer is an Oregon native making her Broadway Rose debut! Selected credits include Dona Elvira in Don Juan (West End Theater, NYC), Doralee in 9 to 5 (Oregon Cabaret Theatre), Mary Hatch in It’s A Wonderful Life: A Live Radio Play (Oregon Cabaret Theatre), Hot Box Girl/Agatha/Sarah Brown U/S in Guys and Dolls (Oregon Shakespeare Festival), Ensemble/Mopsa U/S in Head Over Heels (Oregon Shakespeare Festival), Audrey in Little Shop of Horrors, Clara in Light in the Piazza, and Rita in Lucky Stiff. Education: B.F.A., Southern Oregon University. 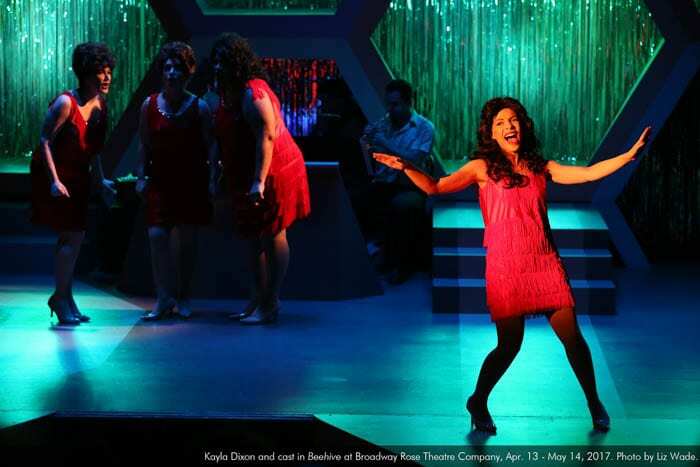 Antonía Darlene is excited to be making her debut at Broadway Rose Theatre Company. Antonía has been in Cinderella, RENT, and The Music Man at the 5th Avenue Theatre in Seattle, and Porgy and Bess at the Seattle Opera. She’s been in AIDA, Showboat, and Saint Heaven at Village Theatre, Footloose at Tacoma Little Theatre and Tacoma Musical Playhouse, Hairspray at Coeur d’Alene Summer Theatre, Fame at Capital Playhouse, and Christmas Survival Guide, Soul on Fire, Stardust, and Sixties Kicks at Harlequin Theatre in Olympia. 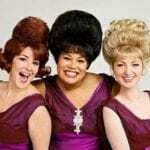 She was Sofia in the Color Purple, Deena Jones in Dreamgirls, Joanne in Godspell, Charlaine in Ain’t Misbehavin’, and Esmerelda in The Hunchback of Norte Dame. Antonía would like to thank God for everything and for her mother who watches over her three beautiful children (number four on the way and due in October!!) and without whom none of this would be possible. "Love you Mommy!!" 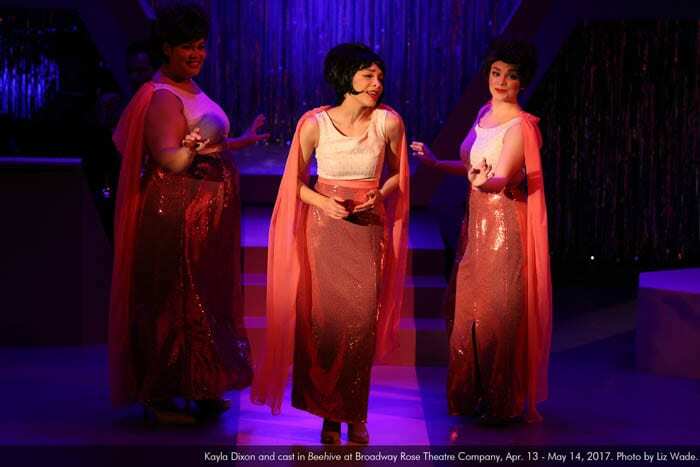 Kayla Dixon is proud to be working with Broadway Rose for the second time! She has several professional credits including Magenta in The Rocky Horror Show and Mary Kate Olsen is in Love at Studio Theatre in Washington D.C., Brenda in Smokey Joe’s Café at Stumptown Stages, Anita in West Side Story here at Broadway Rose, and Claire in Forever Dusty at triangle productions! Her film and television credits include Willa in NBC’s Outlaw, a feature on Grimm, and a featured role in I Don’t Feel At Home In This World Anymore (directed by Macon Blair, the film premiered at Sundance and won the U.S Grand Jury prize in 2017). Kayla is the vocalist for Helion Prime and the internationally touring local doom metal band Witch Mountain. 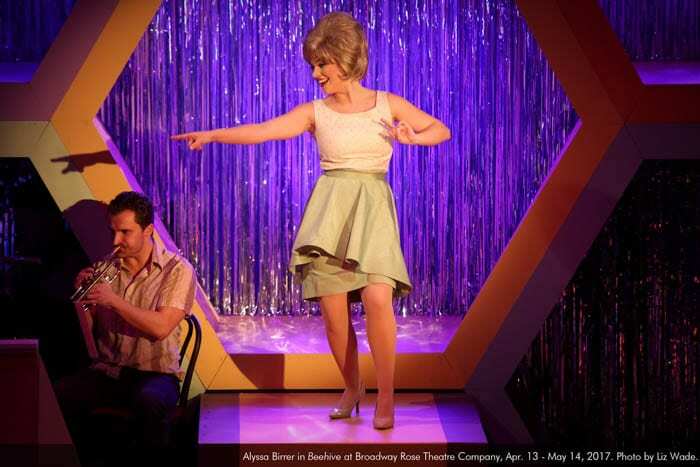 Andrea Enright is thrilled to return to the Broadway Rose stage following her portrayal of Amy in Company. You may have seen her regionally in Prism Theatrics’ Thoroughly Modern Millie (Mrs. Meers) or in New York where her credits include The 25th Annual Putnam County Spelling Bee (Rona Lisa Peretti) and Company (Susan) with the Mount Carmel Theatre Company as well as two world-premiere musicals, Deployed, with the Society of Artistic Veterans, and Sophia! at Write Act Repertory. 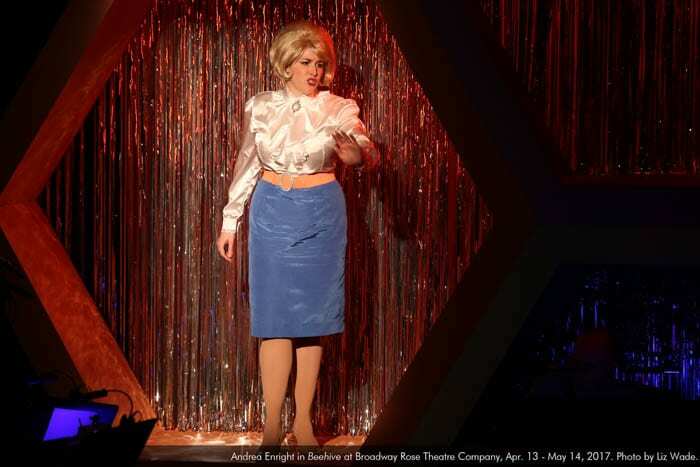 Andrea was also a finalist in the New York Musical Theatre Festival's Next Broadway Sensation competition in both 2012 and 2013 and is a proud graduate of Otterbein University and high school graduate of Interlochen Arts Academy. Learn more about Andrea’s journey at andreaenright.net. For GJ, with love. 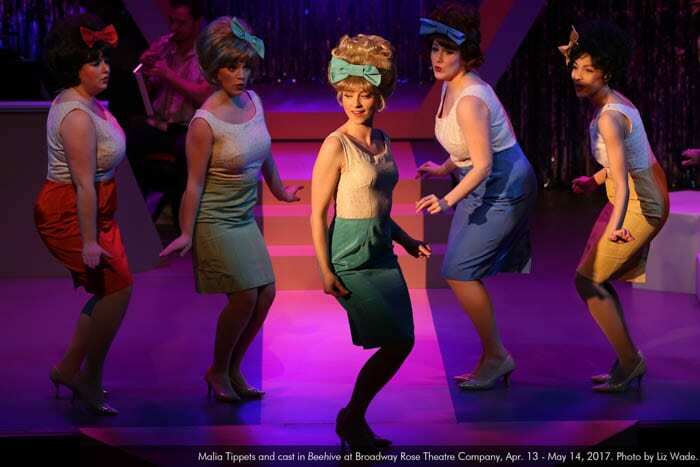 Malia Tippets is thrilled to return to Broadway Rose Theatre after making her debut as Daphne in Fly By Night. 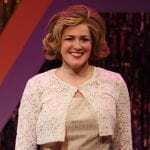 Holding a degree in Theatre Performance from Marymount Manhattan College, she spent her college years performing in New York and went on to tour the nation in the mega musical Evita as Eva Peron. 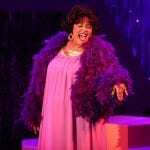 Returning to New York, she was featured in the “Town Hall: Rising Stars of Broadway” concert. She spent two years in Japan, performing as Elphaba in the Universal Studios production of Wicked before returning to Portland. Favorite Portland credits include Carrie: The Musical (Carrie White), Anything Goes (Hope Harcourt), and Heathers: The Musical (Veronica Sawyer). She wishes to thank her parents for their endless support and her love for making every day better. 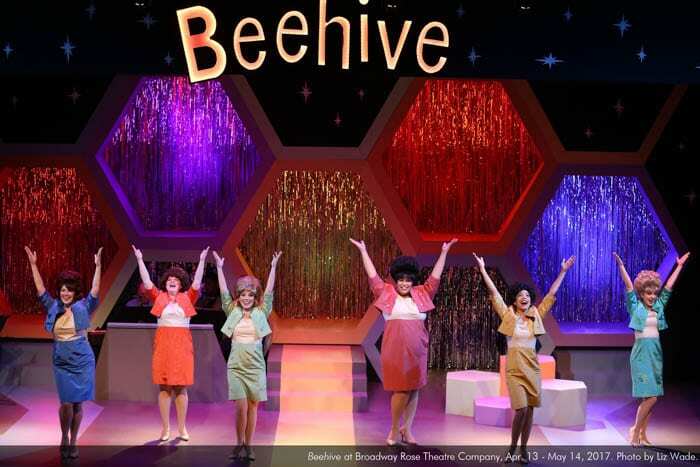 Highlights from the sprawling score include a Supremes Medley, and truly energetic versions of “Respect” and “Natural Woman”…”Beehive” is one of a handful of musicals, or music-infused plays currently running on local stages, and it is the most unabashedly fun and light.… Read more. 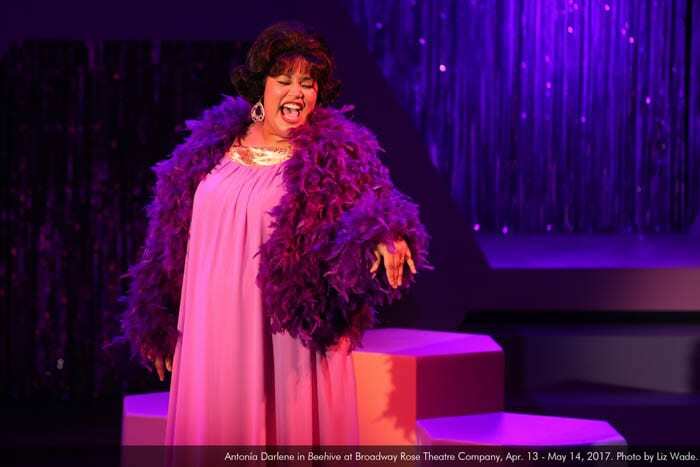 [Andrea Enright] is an amazing Leslie Gore, while [Antonía] Darlene channels Aretha Franklin as if she were the real deal, and Kayla Dixon rocks it as Tina Turner…the Broadway Rose production does the musical proud…. Read more. 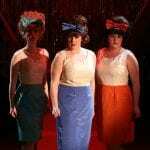 At the end of the performance, the cast and audience have been taken beyond crayons and perfume to an unbridled expression of woman…We become aware of the tapestry that makes up women’s experiences and voices, but most of all the enormous amount of musical legacy they contribute to… Read more. I was swept up in the excitement that brought the audience to its feet to honor the 6 women (and Jeffrey Childs’ band) for a tour de force that transcends nostalgia. My only real complaint is that this was not a “real” concert, so we couldn’t clap and scream for encores… Read more. 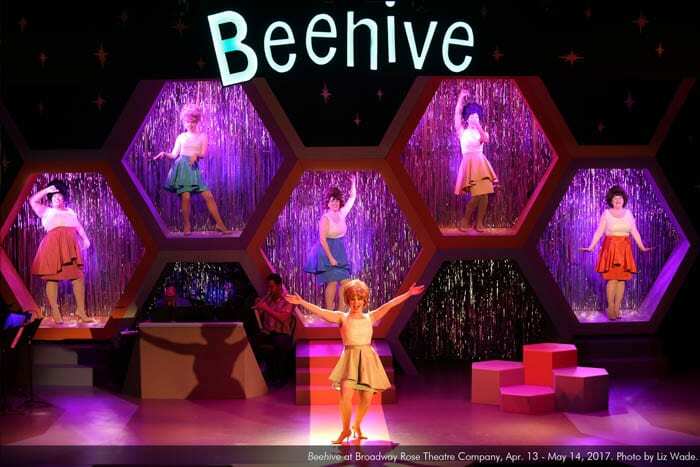 Antonia Darlene is the most surprised of anyone to find herself on the stage in the Broadway Rose Theatre Company’s production of “Beehive,” with good reason. 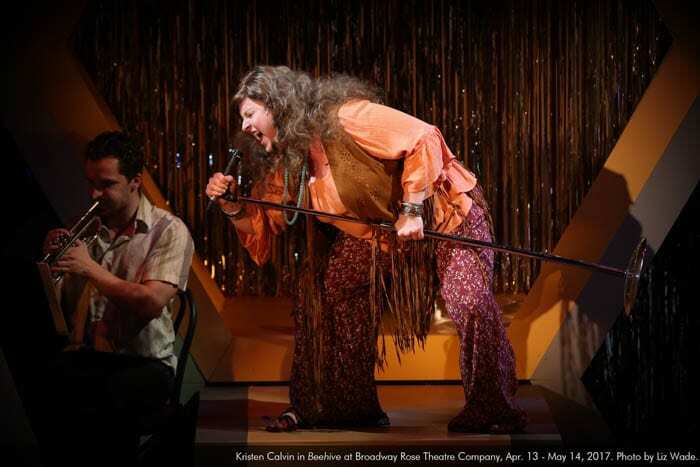 “It was my worst-ever audition,” said Darlene, who gave birth two weeks later...Read more.